Children 18:3’s punk music originates from the confines of Morris, Minnesota. The band’s name gives reference to Matthew 18:3 “And he said: ‘Truly I tell you, unless you change and become like little children, you will never enter the kingdom of heaven’.” Comprised of siblings David, Lee Marie and Seth Hostetter, Children 18:3 had it’s origins as a ska band during the late ’90’s. Seth handles the drum kit, David does double duty as lead vocalist and guitarist, bass player Lee Marie adds her amazing lead and background vocals. The second of two independant EP’s drew the attention of Brandon Ebel who signed the band to his Tooth & Nail label. Their self-titled debut with T&N in 2008, was a hit with listeners who enjoyed the distinctive sound of the band. Genre defying influences such as punk, pop, ska, rock, and even ’70’s new wave, make up the band’s signature sound. 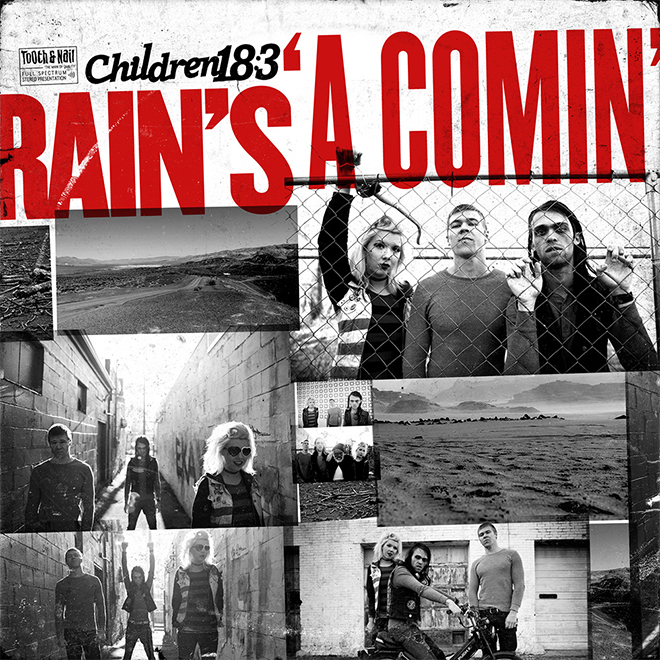 The second release by Children 18:3, Rain’s a Comin’, continues in the same tradition. With a total length of 33 min for 12 songs the listener knows they are in for a fast ride. The title track starts the ride with a very short song that builds the momentum for the album. “Cover Your Eyes” speaks of the ‫impotence of self-reliance. Track three, “The Cruel One” provides a musical journey through the 1966 film, 101 Dalmatians, featuring Lee Marie’s soaring, Blondie-like, “oh-oh-ohs” vocals. “Whispering” is one of two instrumental tracks, the almost stoner rock flavour makes this song easy to skip over. “Hey Driftwood (Tides)” brings the album down to a fun pop sound. “Wonder, wonder If I stood on your shoulders, could I touch the sky? Can we then work back toward the start”. Holds the promises of rain coming”. The oddest inclusion on this album has to be the final track, the instrumental “The Last Laugh” which sounds like a player piano ditty from a silent movie with the band members laughter in the background. Children 18:3 has no contemporaries in the Christian music realm, this band stands out with it’s own unique style. While not for everyone, this band’s delivery of music is earnest and heartfelt. Remember, if you don’t like the sound, punk music songs are short, so bear with it.